Show a little sophistication on your outgoing mail when you finish things off with these attractive return address labels. Brilliant blue marble tiles give you a final touch for letters and packages that is timeless yet unique. You'll leave a lasting impression, but you'll also enjoy the added convenience of this product. Because our labels are self-adhesive, all you have to do is peel and place them on every envelope. That means no more scribbling out your name and address over and over again. 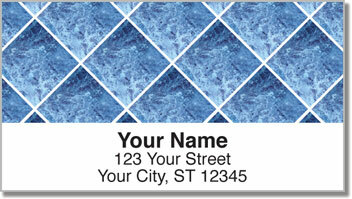 Get your own Blue Marble Tile Address Labels today! We also offer selection in three other colors, or get all four in the multi-colored option.